The law of conservation of energy is intimately related to the 1. law of thermodynamics (Wikipedia) which states that the internal energy of a system is effected whenever energy in form of heat, work or energy attached to entering or leaving mass crosses the system boundaries. - Quite a mouthful. All matter contains at a given temperature, pressure, etc. a certain amount of energy which we call the internal energy. Several components contribute to it like chemical binding energy (for molecules) , the various modes of vibrations (for solids), the random motion of molecules (for gases) and a few more. The trouble is that we don't (and never will) have an instrument with a sensor which when placed on or into our mass could measure the internal energy of the mass at hand. The only thing we can measure experimentally are changes of the internal energy. The ways of changing the internal energy relevant to the analysis and simulating Stirling engines are 1) adding/removing heat and 2) performing physical work by compressing/expanding the working fluid (gas in most cases). In many text books and journal articles the symbol U is used for internal energy of an object and is measured in Joules [J] or lower case u [J/kg] for internal energy per kilogram of mass, often called the specific internal energy. In text books or on the web the specific internal energy is listed as function of pressure and temperature for many different substances. 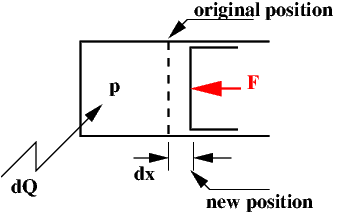 Actually, what you find listed are the changes with respect to some reference point which you can find by looking for the point in the table where u=0. Over time we have come to agree on where this reference point is for many substances so that tables in different publications reflect the same values. For water this reference point is liquid water at its triple point at temperature of 0.01°C and pressure of 0.6117 kPa. The amount of heat needed to raise the temperature per unit of mass of a given substance by one degree is referred to as the specific heat capacity (often "specific heat" for short). But there is a slight problem with this definition, which is particularly grave when measuring the specific heat of a gas. The reason is that gases want to expand with rising temperatures to quite a large extent in comparison to liquids and solids. As a consequence we typically have two different scenarios under which to measure the specific heat of gases. In one we do not allow the gas to expand ( constant volume but pressure will rise ); for the other we allow the gas to expand freely ( constant pressure but volume will rise). We address these two values as specific heat capacities at constant volume ( symbol cv ) and at constant pressure ( symbol cp ). Both carry the sam units, namely energy [J] per unit mass [kg] and per degree temperature change [°K]. The value of κ is surprisingly large, about 1.67 for monoatomic gases like helium, argon, xenon etc. and about 1.4 for gases whose molecules consists of two atoms like nitrogen, oxygen and air. For solids and liquids the value of κ is so close to 1 that often only a single value is listed with the subscript omitted. The values of cp and cv are constant for monoatomic gases over wide range of temperatures ( a few thousand degrees) and pressures and the same holds true in good approximation for other gases at least for the range of temperatures and pressures of interest for Stirling engines. When you push an object across the floor you have to overcome the friction between the floor and that part of the object which is in contact with the floor. In physics we say that you performed work and calculate the amount of work by multiplying the force applied by the distance travelled. The units of work are N*m. Note that torque has the same units, so don't confuse the two. The work (energy) you expand has to go somewhere according to the law of conservation of energy. It actually gets converted into heating up the floor and the object at point of contact (usually too small to detect but present nevertheless). You can visualize it by rubbing the palms of your hands together under pressure. 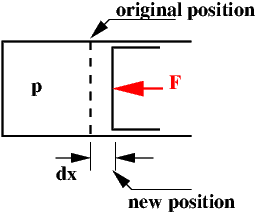 where A = cross-section of cylinder/piston. Observe that when the gas expands (positive dV) we gain work (dW positive) but the gas looses energy according to the law of conservation of energy. The opposite occurs when we compress the gas (negative dV). The work dW comes out to be negative and the gas gains energy. We consider now the gas in a cylinder/piston arrangement but in addition to moving the piston by a small amount we also add a small amount of heat dQ. Both effects will change the internal energy of the gas by a small amount, dU. The minus sign is a historical artifact based on the prior agreement that we count both, heat added and work extracted, as positive. Often Eq. (3) is written in an alternate form which you can obtain by dividing Eq. (3) by the mass [kg] at hand. In mathematics-speak the symbol ∂ indicates partial derivative and the vertical bar with the symbol near its bottom indicates the conditions, here constant volume. Eq. (5) is extremely important when it comes to dealing with ideal gases or gases which are nearly so. For these gases, which are the ones we are using most often in Stirling engines, cv is temperature and pressure independent and therefore the internal energy of such gases is linearly dependent on temperature. We use this here to derive a counterpart to Eq.(5). 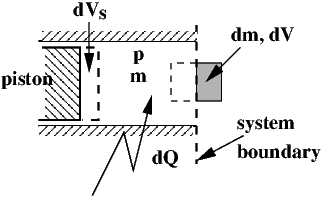 Now, more or less at the same time, the piston is moved increasing the volume by an amount dVs, heat of the amount dQ is added and a mass dm of volume dV is pushed in across the dashed boundary on the right side of the space. The quantity u + p v is called enthalpy for the letter h is often used which is together with the internal energy listed in many thermodynamic tables. This equation together with Eqs. (5) and (7) serves as starting point for much of the detailed analysis of Stirling Engines. * d(p v) = p dv + v dp is actually an approximation which gets more and more accurate the smaller dp/p and dv/v are. A number example : (6+0.2)*(5+0.1) - 6*5 = 1.62 (accurate) while 6*0.1+5*0.2=1.60 (1.2% error). You are welcome to test now with 0.02 instead of 0.2 and 0.01 instead of 0.1.